On a Sunday afternoon in April, fans arrived at an Addison Street stadium, parked for free, shuffled through the gates for $10 and chanted “GOOOOOOSE” in throngs. They were treated to many of the Wrigley Field-type charms – a crackling public address system, bleacher seating and a decaying scoreboard – but were two miles west of that iconic stadium. The team they came to see is professional, boasts a reigning MVP, a YouTube sensation turned record-holder that commutes from Florida for games and an owner who just over a year ago learned of the sport he’s now a part of. At the end of the game, the fans came down to the field and met the players that they came to watch: Jonathan “Goose” Helton, Brodie Smith, Geoff Serednesky and others. 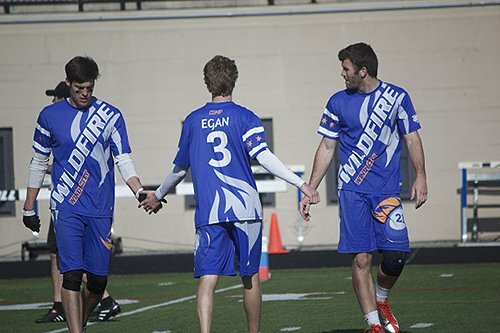 The Windy City Wildfire, a professional ultimate frisbee team and a 2013 expansion member of the American Ultimate Disc League, satisfied its growing fan base with a win over the Cincinnati Revolution, 23-16, on that day. But majority owner Steve Gordon is more excited about gaining the support of Chicago’s thriving ultimate community and of local sports fans as he sets out to pioneer Chicago’s first season of professional ultimate. After a short stint spent selling advertising with the league’s Detroit franchise in February of last year, Gordon fell in love with the sport that he had only just met, so when the league announced that a Chicago franchise was available, he jumped at the chance. Gordon found a home for the Wildfire at Lane Tech Stadium and knew he needed to land some big names to earn respect with fans. For that, he went straight to two of the biggest names in ultimate frisbee, both of whom had Chicago ties. The league’s reigning MVP, Helton, played last season as a member of the Indianapolis Alley Cats. During that season he made the commute from his home in Chicago for games and practices in Indianapolis since moving to the Chicago area in 2010 from Jacksonville, Fla., so that his wife could earn a master’s degree at Northern Illinois University. It was through Helton that Gordon developed a relationship with Smith, who last year also played with the Alley Cats but is better known for his trick-shot cult following on YouTube. The veteran player makes a living teaching frisbee clinics and selling frisbee products and played five years of ultimate at the University of Florida. but couldn’t leave Florida behind. “I actually live in Jacksonville right now, so I fly up every weekend and I do a lot of clinics and stuff during the week – trick shot videos and whatnot,” Smith said. Gordon realized the value in a player like Smith for an upstart team. So far this season Smith leads the league in goals thrown (68), and Helton leads in defensive blocks (22). Smith matched his single-game assists record (12), which he set last season, and Helton holds league records for most defensive blocks in a season (46) and most assists in a season (64). Despite the challenges of finding time to practice around busy schedules, integrating players that have never played together before and adjusting to the rules of a new league, the Wildfire have lost just once in their first eight games of their inaugural season. Smith, Helton and Rook are the only carryovers from the league’s inaugural 2012 season. 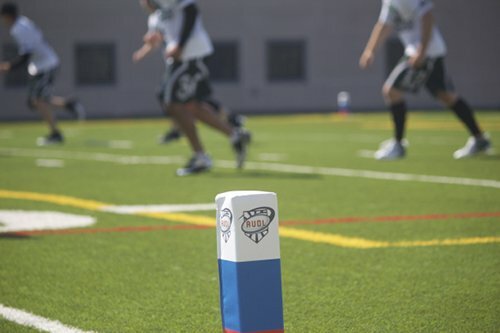 The league plays under altered ultimate rules that introduce field referees, 12-minute quarters (instead of playing to a set score) and various penalties. The Wildfire have so far only played three games at Lane Tech Stadium, but Gordon and his players have been satisfied by the support. 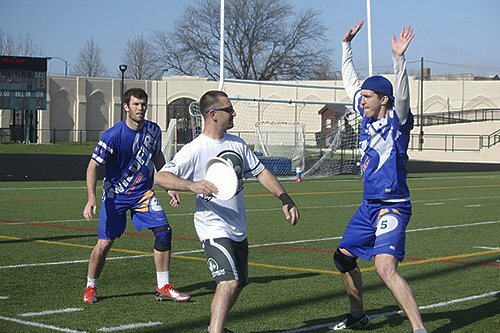 Helton, along with many other Wildfire players have been a part of Chicago’s club ultimate team, the Chicago Machine for many years, but getting paid to play in front of crowds has so far proved far more rewarding.